Last year I judged a chili competition with a number of restaurants in the Bolingbrook area participating. One stuck with me not just because the chili was good, but because they also were serving these delicious little pretzel rolls with it. I'm a sucker for a good pretzel roll. The place was Gordon Biersch, which I had seen many times while visiting the Promenade in Bolingbrook, but never stopped at. 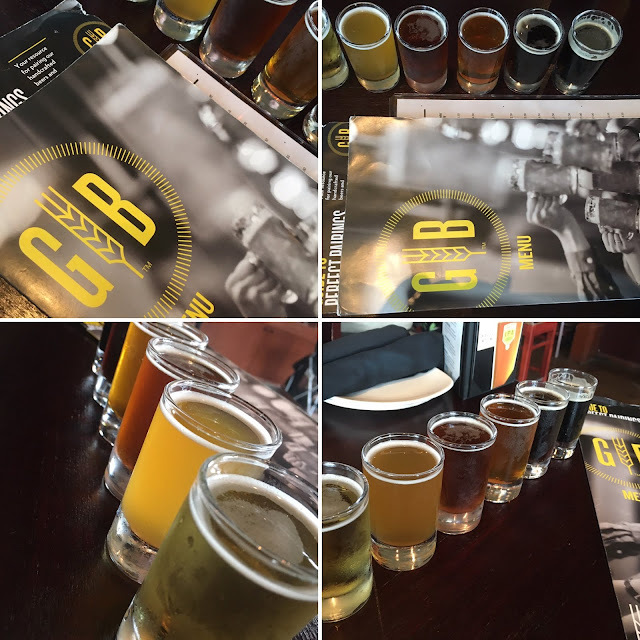 When I learned what a nice beer selection they brew, I had to make plans to visit. 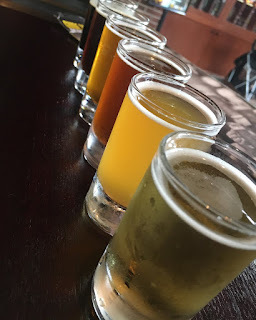 After hubby and I left a recent event nearby at Famous Dave's BBQ, we decided to stop for a drink and some small bites. I really liked the large beer selection and how the beers are separated into categories, like "light and refreshing," "hoppy" or "malty." I'm more a fan of lighter beers or fruity beers and like some of the darker beers, as well. I like lightly hoppy stuff, but not highly hoppy ones. And I've learned how differently people gauge "hoppy." Asking a craft beer drinker if a beer is hoppy is subject to their taste. They might not find it very hoppy, but I do. It's like asking a Mexican person if a dish it hot. While they'll usually tell me it's not, I end up with my mouth on fire because my version of "hot" and theirs are vastly different. Anyway, that's one plus with having a "hoppy" category. That tells me flat out that it's probably too hoppy for my taste and I can direct my attention elsewhere. However, that's also why it's great to get flights. You can try out something from every category and try a bit of each. 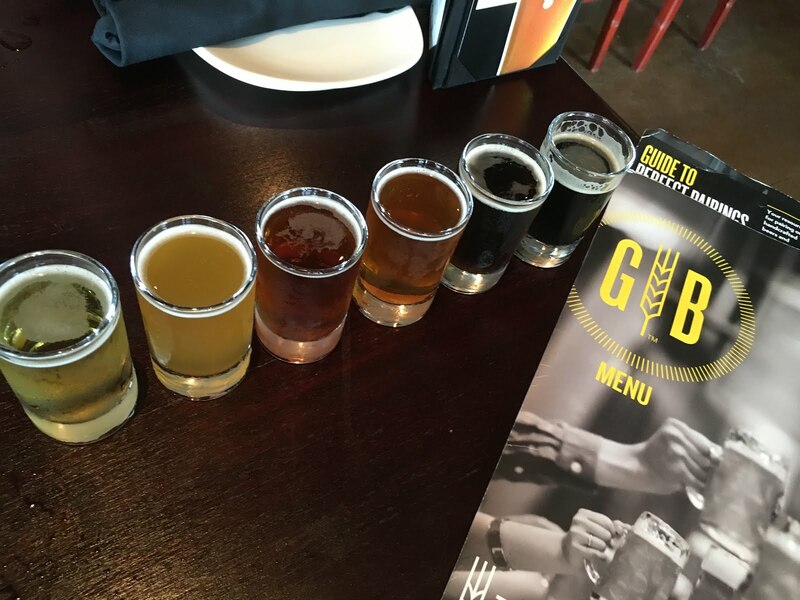 I'm a big fan of flights because I am so indecisive and because I'm a big sampler. I like to have a lot of different things to try. :) Besides, don't flights just make for such pretty pictures when you have several beers lined up with contrasting colors? Of course, my favorites fit in to the categories I prefer. I always love Hefeweizen. Belgian Quad and Golden Export were also faves. 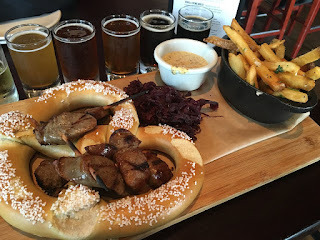 We decided to order something off the appetizer menu to share with our beer and settled on the Brewer's Combo, which could not be more perfect to pair with a flight of several beers. The Brewer's Combo has Marzen-simmered bratwursts (oh so good! ), a soft pretzel and some very garlicky garlic fries. I like a good garlic dish, but wow, this might have been a little over the top even for me. It was accompanied by Marzen mustard (which I loved) and some red cabbage. It was a great beer snack. I would definitely visit again. 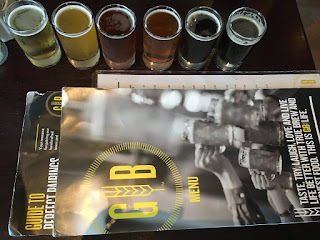 I know there will be a good number of beers - and many in the styles I like best - and there were several other menu items that sounded appetizing and that I wouldn't mind trying out. To check out more on the menus and locations of Gordon Biersch, visit gordonbiersch.com.